Children's author Mara Rockliff - Lights! Camera! Alice! 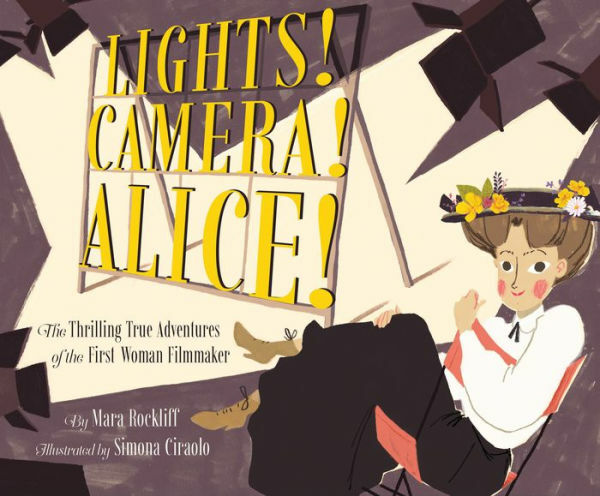 "Subtly STEM, fun, and beautiful to look at, this take on Alice Guy-Blanché’s life encourages kids to engage with cutting-edge technology and to innovate in new fields." She made movies—some of the very first movies, and some of the most exciting! Blow up a pirate ship? Why not? Crawl into a tiger's cage? Of course! Leap off a bridge onto a real speeding train? It will be easy! Driven by her passion for storytelling, Alice saw a potential for film that others had not seen before, allowing her to develop new narratives, new camera angles, new techniques, and to surprise her audiences again and again. With daring and vision, Alice Guy-Blaché introduced the world to a thrilling frontier of imagination and adventure, and became one of filmmaking's first and greatest innovators. Mara Rockliff tells the story of a girl who grew up loving stories and became an acclaimed storyteller and an inspiration in her own right.